"Caliph Harun al-Hakim has long cast an envious eye on our holdings outside of Rokugan, and when word of our renewed war with the Lion reaches him, he may decide the time has come to raise against us." Order your own copy of Across the Burning Sands at your local retailer or online through our website today! 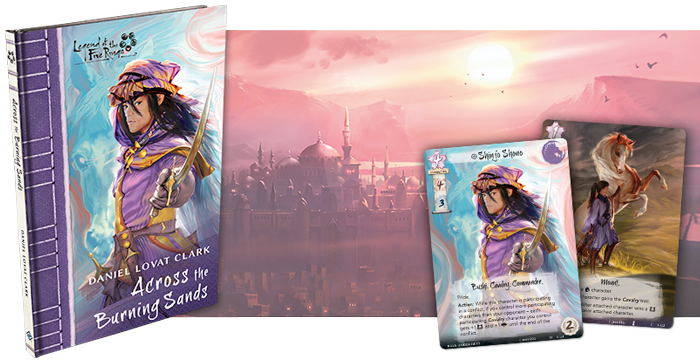 Fantasy Flight Games is proud to announce Across the Burning Sands by Daniel Lovat Clark, a new novella set in the world of Legend of the Five Rings and focusing on the Unicorn Clan! 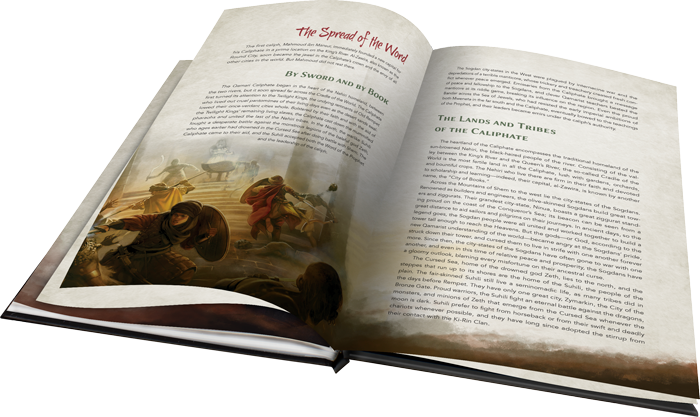 Across the Burning Sands features a full 110 page novella, a sixteen-page full-color insert detailing the history of the Unicorn Clan, and two alternate art cards for use with Legend of the Five Rings: The Card Game! It is a turbulent time for the Unicorn Clan in Rokugan. War with the Lion has put the clan that rides in a precarious position. With so many enemies in Rokugan, they must make sure their holdings outside the Emerald Empire remain secure. This task has fallen to Shinjo Shono, who travels west to meet with the caliph of al-Zawira. But more than a simple negotiation awaits. Shinjo Shono is about to embark on an adventure fraught with peril. What awaits the young Unicorn on his journey? 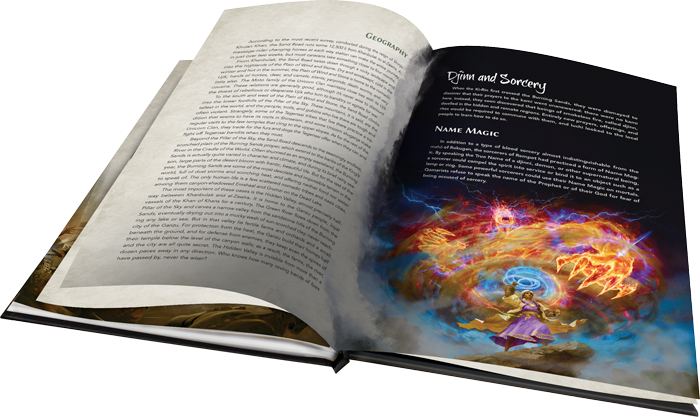 Also included in Across the Burning Sands is a sixteen-page color insert detailing the history of the Unicorn. From knowledge about their unique use of spells and sorcery to the hidden records of their journey outside of Rokugan, this document is the ideal source for anyone who wishes to learn about the clan that rides. 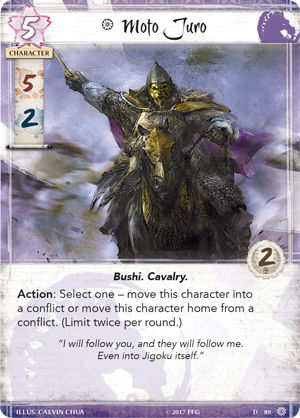 Across the Burning Sands also features two alternate art cards for Legend of the Five Rings: The Card Game. The first of these cards is a new take on Shinjo Shono (Across the Burning Sands, 5), straight from the cover of the novella! Originally found in Breath of the Kami, Shinjo Shono leads your Cavalry characters into glorious battle, and boosts their skills when you have more participating characters than your opponent. Shinjo Shono is a born leader, and when he is on the field, you gain the ability to run down your opponents during any conflict! But what is cavalry without steeds to mount? 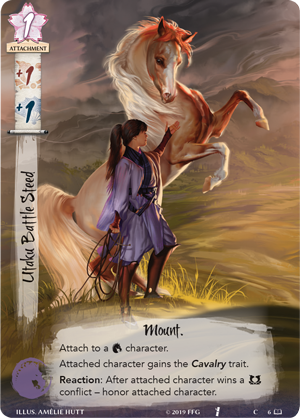 The second alternate art card featured in Across the Burning Sands is the Utaku Battle Steed (Across the Burning Sands, 6). 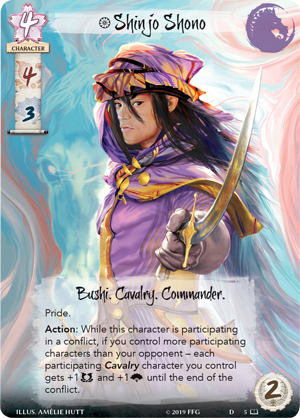 This card, that will also be featured in Warriors of the Wind, allows any Unicorn character to gain the Cavalry trait. It also gives that character additional military and political skill, and honors them when they win a military challenge. This gives any character a significant boost, even if they are already a Cavalry character. Cards like Moto Juro (Fate Has No Secrets, 89) can take advantage of their glory stat to become an even more intimidating presence with the Utaku Battle Steed. Shinjo Shono’s adventure is just beginning. What awaits him in his journey outside of Rokugan? Find out in Across the Burning Sands by Daniel Lovat Clark! Join Shinjo Shono in Across the Burning Sands (L5N03), available now for pre-order from your local retailer or our website! Look for this novella to release in the first quarter of 2019. Dive into the land of Rokugan with Legend of the Five Rings Novellas, available from your local retailer or our website. These novellas are longer than the web fiction found on the website and offer an in-depth look at the major players in the Legend of the Five Rings setting.